Surfacestations now at 70% of the network surveyed | Watts Up With That? See also the related story on the new Google Earth historical imagery tool here. I’m pleased to announce that due to the help of many volunteer surveyors, the surfacestations.org project has now reached the 70% mark for stations that have been surveyed. 854 out of 1221 USHCN stations have been surveyed. In addition, Thanks to the splendid work of volunteers Gary Boden and Barry Wise, a new Google Earth KML file has been released that not only shows what stations have been surveyed and their ratings, but now includes numbered icons, and embedded links to the surfacestations.org online gallery for that USHCN station. You can download the updated Google Earth (used to make the map above) KML file here. There a a couple of caveats. First the lat/lon coordinates used are mostly from NOAA, so some may not be exact. Some that are not precise could be as much as a kilometer off. Also bear in mind that while we do have the stations in hand, and they are used to create the map above, there are a few (about a dozen) that are not yet uploaded to the surfacestations gallery server yet, so you may encounter those few that have a rating but no pictures. This is due to me falling behind because of problems with the server maintenance in the last two weeks, mostly due to rotating IP bot attacks from Beijing, China for some odd reason that cause the server to slowdown and throw a lot of errors during upload attempts. I’m working on it, and these stations will be added in the next few days. Note that stations that have been surveyed but are closed often don’t get a rating if we cannot determine exactly where the thermometer was placed, which is why the pie chart reflects “841 stations rated as of 02/05/09”. For those of you that wish to help, there are still several hundred stations that remain to be surveyed. Especially in South Texas, Missouri, and Illinois. All you have to do to help is to visit www.surfacestations.org and go through the simple signup and follow the instructions. I hope to have this project wrapped up by the end of summer, so if your vacation or travel plans include driving, why not help get a station or two? February 8, 2009 in Announcements, Weather_stations. I have only recently found this site and the associated surfacestations.org, but have found both interesting. Have you tried any analysis on the data yet? I think I read somewhere that none had yet been attempted. I am very curious to see a 30 year temperature anomaly analysis on stations rated 1-3 verses 4-5 stations. As well as an estimated temperature deviation as a result of the stations poor siting. By clicking on the top image [then clicking on it once again when it comes up], we get a clear picture of the really large number of stations that are in the 2 – 5 degree+ error category. Nevermind, I figured it out. Sorry. Time is on a crunch! So we’re flipping out over 0.6C of warming in the 20th century as told to us by a surface station network that, from the looks of it, isn’t even accurate to within 2C? Sounds about right. Hansen and Gore are using the same math banks used to determine who to give home loans to. How can we get Anthony to testify before Congress? Shouldn’t Congress be made aware of data integrity issues before deciding legislation that involves predictions based on said data? Does not seem to be working…? I imagine John V. is pretty much chomping at the bit by now. I did read the article. Missed the first two times around. I read “You can download the updated Google Earth” as meaning you can download the latest version of Google Earth (which I had already done), and not the KML file. I just think it could have been a bit more obvious, like in the first paragraph where it was mentioned. There sure is a whole bunch of orange in western NC where I live…. This is fantastic news. I can’t wait to see the results. This survey is just for the US. I’m sure the rest of the world (ROW) stations are in better shape. Anthony, hopefully I can get Beeville and Boerne, TX to you this week. The UK attempt has gone missing, web site giving 404. Anyone know what has happened? Anthony, I predict that your paper, once published, will be the straw that breaks the camel’s back. Best of luck with this. I’m going to assume an average rating of surface stations to be at an error rate of +1.5C, so the .6C of warming currently is modified to -1C, and that we’ve already lost 1C to the fall of the Modern Maximum. Raging fires in Melbourne aside (my heart goes out to them), the mass of the planet has cooled. Land, oceans, air is all colder. Anthony, How long until you can click on a specific station on that map and have the referenced picture/data pulled up. That would be a powerful tool for the users of this website to be able to access. I have never posted before but want to say how wonderful your site is Anthony and how much I look forward to the final results of this fantastic project. As you may be aware Australia is in the middle of some interesting weather. Massive fires have killed over 100 people and destroyed at least 750 homes in Victoria. Melbourne on Saturday recorded it’s hottest ever day of 46.2C. ( but of course this was at the rather badily sited weather station you have featured in Melbourne. The second big weather event is the vigorous moonsoon and low pressure systems in Northern Queensland. I live just North-west of Townsville and we have received over 1500mm or 60 inches of rain in the last month (Townsville yearly average about 40 inches). Ingham about 100kilometers noth of Townsville has been isolated for the last eight days with rainfalls in excess of 2000mm recorded in some areas. 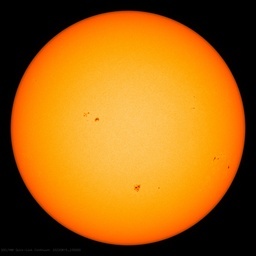 Of course the usual suspects have come forward and said it is all to do with CO2, Global warming and Climate Change. I would like someone to point out to me how these weather paterns as seen in this 7 day animation http://www.bom.gov.au/cgi-bin/nmoc/latest_fwo_loop.pl?IDCODE=IDY00030&number=28 have been caused by CO2. The second challenge: If CO2 did cause these weather patterns how much different would this weather animation look if CO2 had never risen. Slow down a bit. You are confusing offset and trend. Actually, the offset is closer to 2.0°C. But we do not know what the offset was 100 years ago. (Not all the stations were well sited back then.) The difference of what the offset was back then and what the offset is now – including whatever “adjustments” the NOAA, et al., see fit to include tell us the real story. I doubt the US has cooled. But I also heartily suspect that the degree of warming has been exaggerated by, oh, say, a factor of two. Or so suggest LaDochy (12/2007) and Michaels & McKitrick (2008). Remember that a heat sink not only exaggerates a warming trend, but likewise exaggerates a cooling trend (as the effect “undoes” itself). Maybe you should not divulge anything at all prior to publication. I could see some well funded individuals using your map above as a guide and publishing a quick evaluation of their own. Possibly you could preempt such idea “plagiarism” by publishing based on currently available data and updating with a second publication when you get the rest of the data — certainly normal procedure in my field. After all, the actual number of stations is happenstance — not a fundamental constant — i.e. missing a few would not discredit your work. Moreover, with 70 percent of the data so well spread over the entire USA, I imagine the results with current data would be similar to results with all the data. I think your study will be an extremely important and, perhaps, unique contribution — regardless of the findings. I am really looking forward to this study — its the one someone should have done first. It all depends on the exact nature of station history. Unfortunately much of the data necessary to calculate it has been lost or was never recorded in the first place. There is little-to-no doubt in my mind that stations siting is much worse today than it was at the outset. Not only has a spaghetti of asphalt roads (malls, parking lots, etc.) and general Ex-, sub-, and urbanization overtaken many of the sites, but the MMTS cabling fiasco has created a massive number of CRN4 violations. But calculating it all is not an easy task. You forgot the /sarc off tag? Allen63 makes a good point, Anthony. I’m sure all those stations in the sub-sahara are really top notch sites. Anthony, your study shoud have been government funded. Maybe it’s in the stimulus package? A lot of the remote stations are not yet surveyed. These, one might assume, would be more likely to rate 1 or 2 because of their locations farther from cities and towns. Microsite issues could be a problem, but don’t necessarily have to be so. It’s important to get as much of the full network as possible to minimize accusations of cherry-picking stations. Anthony, you may have some problems publishing in a research journal without co-authors. Damnable practice but it is what it is. However, a scientific magazine would be open to such articles. Besides, us schmucks can read the non-journal articles without paying a subscription price or belonging to the professional organization that controls journal access. The other great thing about magazine articles is that sometimes the publisher will give you an upfront paycheck while you are finishing the article. Do you have potential publishers in mind? You can start feeling them out right now if you haven’t already. There is nothing wrong with putting your bait in the water and let the fish fight over who gets the goody. I don’t doubt that my area has cooled. From what I have been gathering of the rest of the US & Canada, it has apparently cooled also. It’s been 58 years since we had a 5 foot or greater snowfall in January, and before that they occured in 1-20 yr intervals. So, I also know it has warmed since 1951. When I get that 5 foot snowfall next January, I’ll know it has cooled. It doesn’t matter where our weather station is, even if it’s in the same place it was 112 yrs ago. Ain’t got enough hick town to hide that much snow. On my side, I wouldn’t be surprised if you actually obtain a larger warming trend doing that. Remember that since the beginning of the 20th century, many American cities “de-industrialized” in the sense that many “hot” industrial plants left the cities themselves to go the countryside (because of pollution concerns). Including chemical plants, steel industry, and the like. A lot of the remote stations are not yet surveyed. These, one might assume, would be more likely to rate 1 or 2 because of their locations farther from cities and towns. Actually, I have been zeroing in on the remote rural stations for virtual surveys. If anything, I have added a bit of a “rural bias”. But my hit rate for CRN1 is still under 3%, and very few CRN2s, either. The rural sites may not have UHI, but they are rife with microsite issues (usually the usual MMTS issues). So, 70% of stationed are surveyed, of those nearly 80% have an error potential of >2C. Even if the remaining 30% are absolutely perfect, CRN 1 class, the majority of stations will be producing inaccurate data. Time for that $140million to be spent on updating the existing stations and applying good correction factors to data already supplied by them. Anthony or moderator, please send me the new .kml file. I live in IL and might be able to handle a couple SW of Chicago on my next camping trip (if it ever gets warm enough)… Thanks, Mike S.
My feeling is that when all stations are accounted for, all data collected and evaluated, the results will very likely embarass those responsible for running the stations and collecting climate data. There are just so many 4 and 5 rated stations. It’s as sloppy measurement as you can get. Evan, please leave me Galva and Monmouth ! Between you and me and Scott Finegan, I think we have Morrison, IL pretty well charted. hmmm…i havent had time to read all of the other posts so forgive me if its been repeated but….it seems to me that alot of these stations are rated “poor” quality or even “worst”….and this is who we trust to keep weather data when they cant even keep their instruments calibrated to within a degree. I’m hoping to get the Olga, WA station done within the next couple weeks. It should be a nicely rural station, since it’s on a sparsely populated island. Google Earth doesn’t have any good images of it so an on-site survey is the only way to go. Not so fast there. I’m no expert, but a lot of those “heat sinks” are also absorbing solar energy. They’re warmer when it’s warmer, but they’re also warmer when it’s cooler if there’s sun out. So, it’s not exatly likewise. At night, they’ll get colder and stay cold for while, but the sun will quickly obviate that, I think, in many cases. I’m actually rather amazed at the effect of solar heat sinks. I used to live in a little row house in a Midwestern city. It had a great garden in back due to buying a ramshackle house behind it and tearing it down. In any case, this garden would stay green late into fall/early winter. I’d harvest sage in January and parsley in December. Then, in late winter I’d get the spring flowers blooming before anyone else. Why? Well, in addition to a nice south face, and a few dark rocks in the garden, there was a large black top parking lot directly to the west and a bit north, and then there was another larger one one more block to west. That thermal mass never made it any cooler during the winter. All true. The added offset never goes away. BUT . . . I think you are slightly missing my point. I am — not — saying that concrete makes the offset cooler. I am saying it can exaggerate the trend (sic). Once (after) the offset is in place, the effect of the heat sink exaggerates a warming trend. And when temperatures cool, the effect goes away at the same rate. Look at Yilmaz et al. (2008). During the day, the siting over concrete warms at a faster rate (sic). Then, as night falls, it cools off at a faster rate (it still winds up slightly warmer than siting over grass), as the effect unwinds. This is to be expected; forces must balance. Scott: Galva and Monmouth are yours . . . It is very, very rare that Google Earth has an image sufficient for a survey without a call to the curator to get the precise location. I would say that it is impossible to confirm an MMTS with any degree of certainty via even the best Google image and only very, very rarely possible to confirm a Stevenson Screen. LiveSearch birdseye view makes it possible (though often difficult) to make a (more or less) definitive ID, but we’ve nailed just about all of the stations where Bidrseye is available (some are no longer there or are obscured by trees, etc.). Take Watertown, NY. You would swear the MMTS was in the “back yard” right near the given coordinates. But a call to the plant revealed that it’s actually right near the entrance (a different “white dot” altogether). And it’s a rare case where even a CRS shows up at all on GE, much less an MMTS. Caution and confirmation is the key. Once you confirm the precise location via phone call, you can then take a measurement view using the ruler function — unless the GE image is no good. I have to disagree. This isn’t a study of urban heat island effect. This is about siting issues. In fact, your explanation would probably increase the trend. If you use rural stations to calculate UHI of the non-rural stations, and the the rural stations are warmer because of industrialization, then the rural staion isn’t going to allow a good calcuation of the UHI. Scott: Galva and Monmouth are yours . .
No, nooo. That was me, not Scott. Guess I’d better hurry. Regardless of disagreements we have had in the past, you’ve accomplished quite a feat crowdsourcing surface station ratings and gathering everything together. It will be interesting to see how the analysis pans out, though I suspect that unless there was an obvious bias in early station survey choice the results will be similar to the earlier effort: http://www.opentemp.org/_results/20071011_CRN123R/crn123r_gistemp_5yr.png. I’d also suggest potentially bringing on JohnV as a coauthor. Your differing opinions on climate science would help legitimize the objectivity of the end-result (though, peer review and transparency of methods helps as well). REPLY: Zeke, thank you for the recognition. While you do raise an interesting suggestion, I’ll point out that JohnV never so much as bothered to contact me before writing his code and releasing his very first results using only a handful of stations. Later I did some discussion with him, via Climate Audit, and the result you reference above is a result of that but uses only 17 CRN1/2 stations with poor spatial distribution. That you see his very initial effort, sans any early collaboration in the design or even courtesy notice to me to say that he was doing the project, as somehow legitimizing my own effort now speaks to your own bias. If you visit opentemp.org and type in my name in the search box in various ways, you won’t find it mentioned there, which seems a poor way of providing attribution for the work upon which his was predicated. As I’ve pointed out many times, if I had done an analysis at that stage, in late summer 2007, with so little coverage and poor distribution, and found a significant difference that went the opposite way of JohnV’s finding’s, you and many others would be all over me crying “foul” and pointing out why my effort was flawed and premature. Yet JohnV did exactly that, and not only is his work held up as an example of why the surfacestations effort itself was flawed in many of the forums you frequent, including your own (and I’ll point out that you also didn’t bother to even contact me before writing your own opinion on the project, an objective reporter gets both sides first), but JohnV gets a “free pass” for publishing an analysis prematurely. But instead of doing a premature analysis, I’ve kept at the task of data gathering, and only published updates of the census data and distribution, while highlighting interesting issues with stations. JohnV’s opentemp effort appears to have no updates since late 2007. At this point I have no idea what the analysis will show on national or regional scales. Does siting matter on a national scale? I think so, but I’m not excluding the possibility that it does not once the data is appropriately filtered. We’ll find out. Had this been a funded project from the outset, few people would even know about it, but making this an all volunteer effort, the only way to make it happen is to keep it visible. I’ve taken a fair amount of flak for that, but given that NOAA, NWS, NCDC, and GISS have not taken on this task of quality control evaluation of siting, I think the fact that we’ve been able to get as far as we have means that I made the right choice. Besides, as Even points out, the issue is more complex than just comparing stations due to regional trends. Opentemp may have some useful tools, but the way it was presented at outset certainly didn’t lend itself to collaboration later. I won’t rule out the possibility of using opentemp for some portion of the analysis, but collaboration probably isn’t in the cards without some public fence mending. I will say though that your suggestion legitimizes the effort, having gone from early vocal complaints of “pictures don’t matter” to now suggestions of collaboration with an early critic, points to the recognition that maybe pictures matter after all. You make an interesting suggestion. 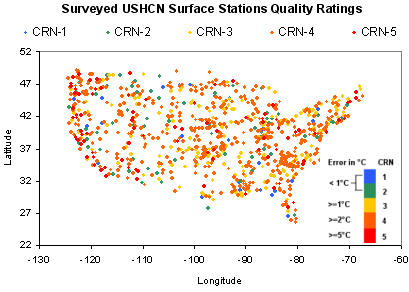 I’m curious what you see that would be beneficial about incorporating an untested code base with a first look analysis of the CRN ratings of the US surface stations. The notion that authors should seek to collaborate with critics of their work is a potent idea. It has the potential downside of tripping on human foibles that we all posess, but the legitimizing of the objectivity sounds like it would have significant benefits. Perhaps an article by you on the Yale Forum on Climate Change & The Media (http://www.yaleclimatemediaforum.org/index.php) would go a long way in explaining those benefits to all. Sorry, Mike. No need to hurry. Google earth is really lousy for those sites . . .
And a lot of those CRN1s and 2s are ASOS setups in airports. So you have the HO-83 sensor warm bias plus the various airport issues. It’s not as easy as just totting up the various ratings and comparing the trends. I have been round and round trying to locate “RAW” data. I checked out WUWT & CA Resources links. I checked out Craig Ipso’s CO2Science climate data. There is a data set that is “raw + USHCN adjusted”. Every data set was raw + something. And none matched the B91 handwritten observer forms. Anthony, what data set(s) are you using for your study? I notice that there is a “line” of “?” stations with 3 in S. Ohio, then 1 near the Ky-WV border, and then further south, there are 2 along the WV-Va border. Please send me the coordinates/location names, or where I can get such, and I will see what I can do over the next few weeks. I’m not far from several of these. Pics from 4 sides and notes on mounting height? Since you followed JohnVs work on Crn123, you should have followed my work on CRN45? So what did I show about CRN45? and why did JohnV agree with it? It strikes me as Odd that the early work done my JohnV and me has receieved such uneven coverage. Basically I found and JohnV confirmed that CRN45 stations had warming trends higher than CRN123. The CCP hate this site because it is considered a gathering place for bourgeois, reactionary forces. No joke. This is a great accomplishment. Any macro environmental studies, and their accompanying conclusions, have to start with good data otherwise their conclusions are flawed. Garbage in, garbage out. Everyone involved in these surveys deserve a pat on the back. I agree that CRN45 had a higher warming rate than 123 (as I posted over at Lucia’s place the other day). Its yet another interesting result that may come out of the data. 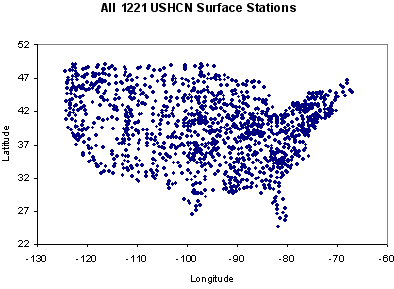 JohnV’s analysis (posted above) used 62 CRN123 rural stations with a reasonably comprehensive geographic distribution (http://www.opentemp.org/_results/20071011_CRN123R/map_crn123r.png). That said, there is certainly the possibility that the analysis may change now that more data is available. My hunch is that it will not, but part of the fun of science is being proven wrong. I do (and have) apologized in hindsight for not emailing you when writing up that story in October ’07. My only concern with the project early on was statements by you and others involved that seemed to imply that siting problems in individual stations implied that the overall GISS reconstruction for the U.S. was seriously flawed, with no analysis at the time to back it up. JohnV presented the first thorough analysis of the data collected, and his preliminary conclusions were interesting (though, admittedly, they only relied on 34 percent of all stations). OpenTemp itself seemed to be created out of a legitimate interest in creating a transparent easy to use analysis tool for the Climate Audit community, and a number of other folks (mosh among them) used it for various things. It is a shame that it was discontinued, though real life does have a habit of getting in the way of our hobbies. It might be interesting to revive it or create something similar for your analysis, so that others can use the tool to perform various tests. For example, if will be interesting to look into why CRN45 stations trend higher than CRN123, and if that is confined to urban areas or extends to rural as well (which will hopefully tell us a bit about UHI!). An open source independent reconstruction of surface temperature will be a great resource (given the mess that is GISS code) for use by everyone, and now that the data is finally to the point at which you feel that it is ready to analyze, it would be a shame for a useful tool to go to waste. Keep something in mind here (Anthony correct if needed) — the CRN1/2 station analysis is a “good” thing, but only a start. It still doesn’t take into account station moves which effects are buried in the records. A CRN1/2 may have been CRN5 in its previous location. Until station move effects are quantified on each station record, it’s still not the true, unbiased temp history — unless the station had no moves. OTOH, I am sure the NOAA raw data exists because St. Mac made a set of color maps of it to compare USHCN1 adjustments over the 20th century. So I’m guessing it’s available–somewhere–over on CA. 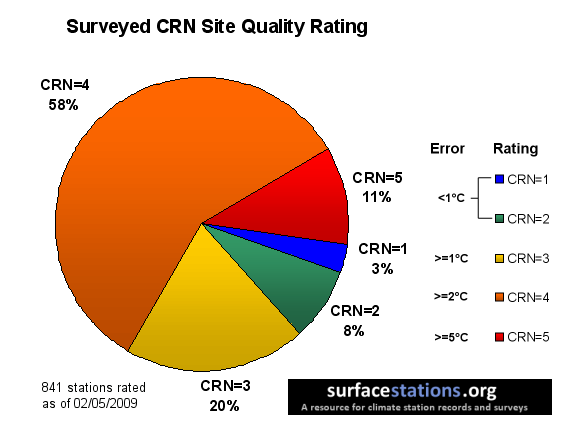 I suspect that adjusted CRN1&2 stations match adjusted CRN4&5 stations quite well. But not for the reason one might think! What I bet has happened is that INSTEAD of CRN 4s & 5s being adjusted down to the rates of CRN 1s & 2s, CRN 1s & 2s have been adjusted UPWARDS to match the rates of CRN 4s & 5s. We’ll find out when Anthony et al. do the hammer-and-tongs analysis.